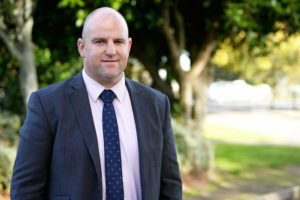 The New Plymouth Boys’ High School Board of Trustees is pleased to announce the appointment of the current Deputy Headmaster, Mr Sam Moore, as the school’s 11th Headmaster. Mr Moore will begin his new responsibilities in Term 2. Sam Moore is an Old Boy of St Patrick’s College, Silverstream so has an excellent understanding of traditional boys’ Schools. He has a Diploma in Teaching and a Graduate Diploma in Technology. Sam is an experienced and accomplished Hostel Manager. In 2008, Sam was appointed as a Housemaster at Feilding High School (FHS) and in 2012 has been their Hostel Manager. Sam has also been a year 11 Dean for the past 2 years. In 2015, Sam was appointed Director of Boarding at NPBHS. Sam’s passions are diving, golf and more recently multisport. He has also been FHS’s very successful 1st XV rugby coach from 2008 – 2015 taking their team to many titles and victories. Sam has been NPBHS’s 1st XV coach for the last two years.